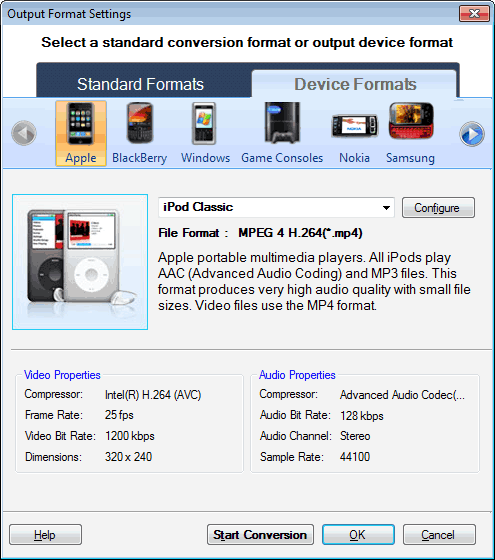 A wide range of devices are supported for the playback of your converted media files. You can check if your device is present in the available output formats. Click Formats >> Select Device Profiles. Select the output device format of your choice and configure its audio and video properties if necessary. Select the manufacturer (Apple, Sony) or device type (Mobile Phones). The drop-down list will then let you pick your specific device. For instance, if you select Apple, the choices will be: iPod Audio, iPod Classic, iPod Nano, iPod Touch, iPhone, iPad, iPad HD, Apple TV, etc. If your exact device is not listed, you can experiment with profiles for similar devices from the same maker and find one that works. You may contact us to suggest for support for more devices. Note: All these device profiles have the best configuration of audio and video properties to play on your multimedia device. However, you can adjust these properties by configuring them.